Louis S. Cravalho, 91 passed away peacefully on November 29, 2018 at Hospice Maui Hale. 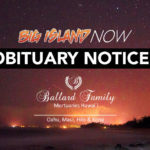 He was born on March 26, 1927.He worked at various jobs in the pineapple industry, in 1992 he retired from Maui Land and Pineapple Co.Visitation will be held from 9:00 a.m. to 11:00 a.m. on Saturday December 15, 2018 at Norman’s Mortuary, Wailuku. Prayer Service at 11:00 a.m. and burial will follow at 12:30 p.m. at Valley Isle Memorial Park in Haiku.Louis is survived by his wife, Mabel Cravalho, daughter Linda (Anthony) Kanoa and, son Louis (Agnes) Cravalho. He is also survived by his 5 grandchildren, 19 great grandchildren, and 4 great-great grandchildren. Brian Joseph De Ahl, 41 of Lahaina, passed away on November 30, 2018 at his residence. He was born on July 9, 1977 in San Francisco, California. Brian worked in various restaurants.